Love, Mrs. Mommy: 5 Winners! Litom LED Outdoor Motion Sensor Solar Light + $10 Amazon Gift Card Father's Day Giveaway! $250 TRV! 5 Winners! 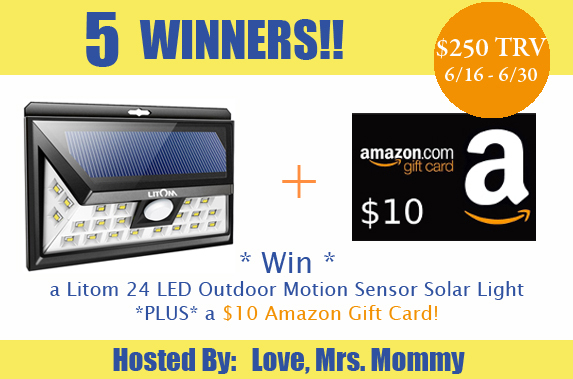 Litom LED Outdoor Motion Sensor Solar Light + $10 Amazon Gift Card Father's Day Giveaway! $250 TRV! a Litom Super Bright 24 LED Outdoor Motion Sensor Solar Light *PLUS* a $10 Amazon Gift Card! A $250 TRV giveaway! Please take a moment give this sponsor some love on Facebook! Hi, and thanks for your posts. Did you by any chance try entering the giveaway on another browser? The form seems to work best on Google Chrome and Internet Explorer. Also, if you clear out your browser history, that definitely helps to reset everything. Thanks and best of luck! I would love to win one of these Litom solar lights. Thank you Mrs. Mommy for the chance !